A growing number of people in Europe are no longer capable of financing their everyday expenses, neither from their earned income nor from a public transfer income. In reaction, an also rapidly growing number of new initiatives has been established: like food pantries and clothing distribution centers. These charity based initiatives are often run by charity organizations and local churches. In social sciences this widely spread, but less perceived phenomenon is called "charity economy". 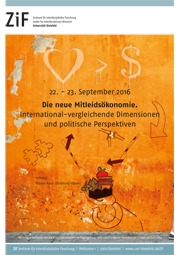 The ZiF-Workshop "Charity Economy: International Dimensions and Political Perspectives" aimed (a) to open an inter-disciplinary and international discussion of that new charity economy; and (b) to compare this phenomenon with alternatives, especially self-organized sharing networks. These perspectives allowed relating the phenomenon of a new charity economy in an adequate way to the current transformation of welfare. Please direct questions concerning the organisation of the workshop to Trixi Valentin at the Conference Office (phone: +49 521 106-2769 / Fax: +49 521 106-152769). Questions regarding scientific content and contributions should be directed to the organizers.